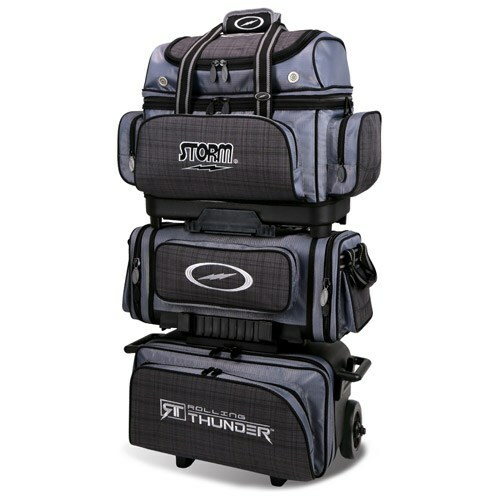 The Rolling Thunder line of bowling bags are Storm's top of the line bags. This 6 ball roller is no different and boast tons of high performance features from 3 high tech wheels to a Dual Frame Locking Telescopic Handle With Grip Release and everything in between. Storm thought of everything with this bag including a detachable 2 ball tote that can be used when you just don't need 6 bowling balls. What more could you want? Dimensions: W 23" x D 14" x H 39"
Will all bags separate from each other on the Storm Rolling Thunder 6 ball bowling bag? Is there an inside zipper pocket in the bottom bag? Hi Doug. This bag includes a detachable 2 ball tote that can be used when you just don't need 6 bowling balls. The top part will detach from the bottom. Unfortunately not all of them will separate. The top section will come off making it a two ball tote and the bottom will be a 4 ball roller. It will be about the same length. Due to the time it takes to produce the Storm Rolling Thunder 6 Ball Roller Charcoal Plaid/Grey/Black ball it will ship in immediately. We cannot ship this ball outside the United States.